We left a little late (one of life's great challenges is to load our girls into the minivan, with their snacks, water cups, movie, coloring books, blankets, shoes, socks, scooters, roller skates and sundry accouterment), and I was urged to keep the car under 70 for the duration of the trip up to Castro Valley. As a consequence, we rolled into the parking lot with about 5 minutes before the starting gun. I ran down, grabbed my bib, and finished pinning it on with about 30 seconds to spare. I started fairly close to the back so spent the first mile or so wending my way up toward the front. There was a somewhat high ratio of young runners participating--I think many were members of a youth running club. The trail, as evidenced by the map above, is an out-and-back course. The first mile and half is an asphalt path. 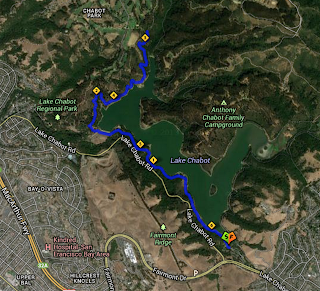 After it crosses the dam, the path turns to a dirt fire road, then the last 1/2 mile before the turnaround is a trail. Low rolling hills are spread throughout the course. By the time we got to the dam I was in about 10th place or so. A few taller hills at the start of the fire road thinned the racers more, and I just caught a teenage boy in third place as we entered the single track. After the turnaround, I paced my young competitor for a half mile before passing him on an uphill. Then he thundered past me on the downhill. OK, thought I, there's no reason to believe I can't catch him on the next hill--and I did. Only to watch him tear down downhill ahead of me. I was running reasonably quickly on the ways down, gimping just a little to save one knee but this kid ran without abandon. His strides were too long on the uphills, and his calves were probably weaker than mine but he was in better overall condition ran down those hills with cruel disregard to my joints. I did pass him one last time once we reached the paved path, and convinced myself I would try and catch up to him again on the last flat half mile if I couldn't keep up with his downhill. At the start of this last half I was lucky enough to catch a glimpse of my family across the reservoir, hollering and jumping around on a dock. The fast kid wound up not waiting for me to catch up and finished about 20 seconds ahead of me--may as well have been a mile. I finished first in my age group, so earned a medal--my first, I believe. The winner and runner up were 22 and 25, respectively. The kid was 13! Next time, padawan. Kirsten and the girls came roller skating and scooting back from their dock shortly after I finished. They are always very supportive of my running hobby. I think they had some story to tell about how Julia careened wildly on her scooter down the path, shocking outdoor enthusiasts and woodland creatures alike. The race tee shirt is a nice green technical tee. It's a little heavyweight for really warm weather, but nice at wicking sweat and whatever else it's supposed to do. Cover my torso. There were free smoothie samples, and a whole mess of snacks meant for the untra runners. Next up, Indian Gulch 10 mile.